Learn how membership can propel your organization and your career. 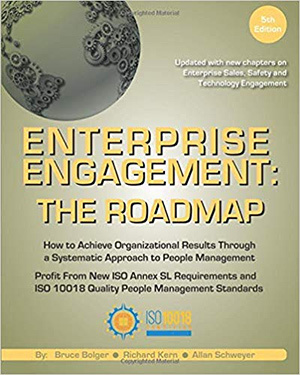 Enterprise Engagement: The Roadmap: The first formal curriculum on Enterprise Engagement. Engagement Academy Online: Free online courses. Certification: Recognition for basic and advanced mastery of Enterprise Engagement. Business Development: Training, thought leadership, and content marketing strategies for solution providers. Executive Briefings and Coaching Presentations on the economics, the definition and framework, ISO requirements, human capital disclosures, and the importance of having an Enterprise brand. Enterprise Engagement Speakers Bureau For your next conference, you can select from a variety of senior leaders of the field who have front-line experience in all aspects of engagement along with worldwide public speaking experience. Training: On-site or webinar-based learning programs. Consulting: On-site or telephone-based assistance with the development of Engagement business plans and implementation. Engagement Strategies media: The latest news, research, case studies, solution providers, organizations addressing all areas of engagement. Engaged Company Stock Index: a tool that tracks the nation’s public companies with the highest level of customer, employee, and community engagement. Rewards Recognition Network: Aggregate data on reward redemptions, research, and what’s new in rewards, recognition, and loyalty programs. Good Company Index. Click here for more information. Engaged Company Stock Index began at $10,000 on Oct. 1, 2012.